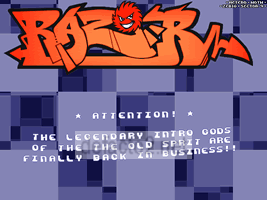 i think i saw the (absolutely rocking) loogo in an early 90s rzr intro already. but yeah, this rocks! Says it's not a valid win32 exe. Bad presentation, maybe just corrupted with age, I don't know. Pig. Great one, once more from Razor 1911. I belive this one was already added like all hetero intros? Says it's not a valid win32 exe. not a valid win32 exe..
Ze Big logo is really good... Simple but great. page created in 0.016174 seconds with 15 queries.